This issue of Psychiatric Clinics, edited by Drs. 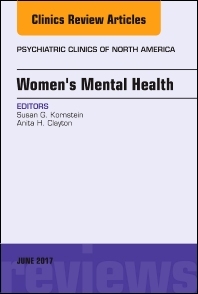 Susan G. Kornstein and Anita H. Clayton, will cover a wide arrange of topics in the field of Women’s Mental Health. Topics covered in this issue include, but are not limited to Psychopharmacology in Pregnancy and Breastfeeding; Binge Eating Disorder; Substance Abuse in Women; Dementia in Women; Neuroendocrine Networks and Functionality; Lesbian and Transgender Mental Health; and Reproductive Rights and Women’s Mental Health, among others.